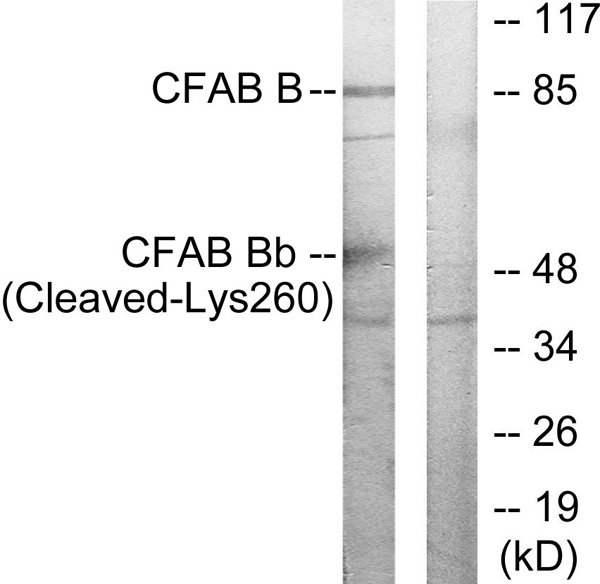 CFAB Bb (Cleaved-Lys260) antibody detects endogenous levels of fragment of activated CFAB Bb resulting from cleavage adjacent to Lys260. The antiserum was produced against synthesized peptide derived from human CFAB Bb. Small volumes of anti-CFAB Bb antibody vial(s) may occasionally become entrapped in the seal of the product vial during shipment and storage. If necessary, briefly centrifuge the vial on a tabletop centrifuge to dislodge any liquid in the container`s cap. Certain products may require to ship with dry ice and additional dry ice fee may apply. Western blot analysis of extracts from K562 cells, treated with etoposide (25uM, 1hour), using CFAB Bb (Cleaved-Lys260) antibody. NCBI/Uniprot data below describe general gene information for CFAB Bb. It may not necessarily be applicable to this product. Factor B which is part of the alternate pathway of the complement system is cleaved by factor D into 2 fragments: Ba and Bb. Bb, a serine protease, then combines with complement factor 3b to generate the C3 or C5 convertase. It has also been implicated in proliferation and differentiation of preactivated B-lymphocytes, rapid spreading of peripheral blood monocytes, stimulation of lymphocyte blastogenesis and lysis of erythrocytes. Ba inhibits the proliferation of preactivated B-lymphocytes. Davrinche C., Immunogenetics 32:309-312(1990). Mejia J.E., Hum. Immunol. 39:49-53(1994). Schwaeble W., Immunobiology 188:221-232(1993).